We can use regular small brinjal variety or also the long onces though small ones are better to use. Made with good homemade sambar powder any sambar taste more delicious. If you look for simple and easy sambar then this recipe is for you and also to make some quick easy meal, nothing much to be done just serve with some papad, fryums and delish lunch is ready. I normally do the tempering first then follow the sambar making procedure. You can prepare the sambar and do add tadka finally too. 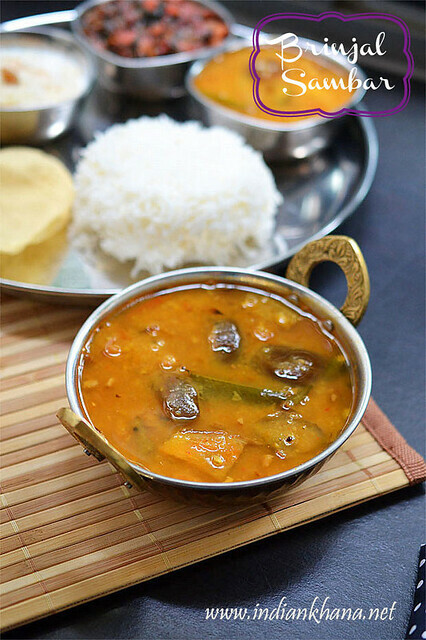 Enjoy these yummy brinjal sambar with rice of tiffin items. 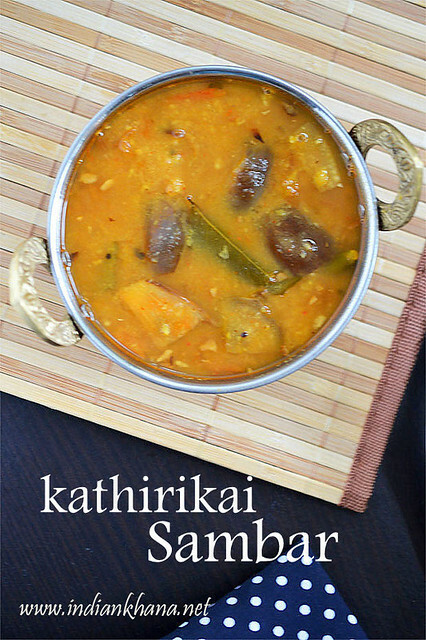 Vegan and healthy sambar with Kathirikai (brinjal). Wash and pressure cook dal for 3 whistles, once pressure released mash dal with wooden masher and keep aside. Meanwhile Soak tamarind in 1/2 cup water for 10-15 mins and extract juice adding another 1/2 cup of water. Peel and slice onion, finely chop green chili, coriander leaves, tomato. Cut brinjal head and cut into 4 pieces. If using long brinjal variety then cut them into 2" long pieces, immerse in water until required. Heat oil in a kadai or pan, add all the items listed under 'For Tempering' and saute. Add onion and saute until onion becomes soft. Add brinjal pieces and saute for 4-5 becomes or until it starts to becomes soft. Add tomato, sambar powder, mix and cook until tomato gets mashed. Add 1/2 cup water and cook for 4-5 mins or until brinjal gets cooked. Add tamarind water and bring it to boil, simmer for 2-3 mins. Add dal and 1 to 2 cups of water, salt mix and bring to boil, add jaggery simmer for 4-5 mins, add coriander leaves, stir and off flame. Serve with rice, fryums or papad. I made along greens stir fry, semiya. 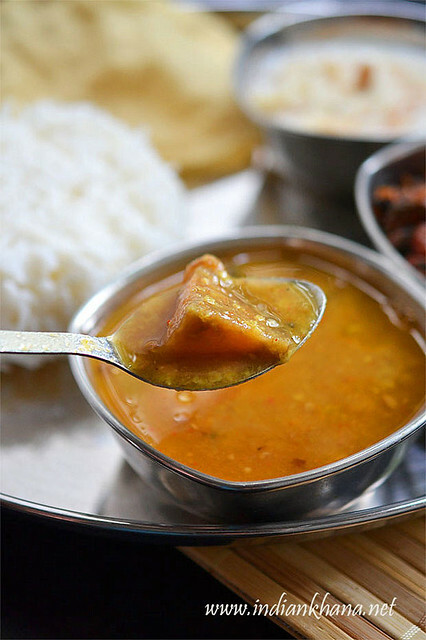 You can also serve this sambar with idli/dosa. 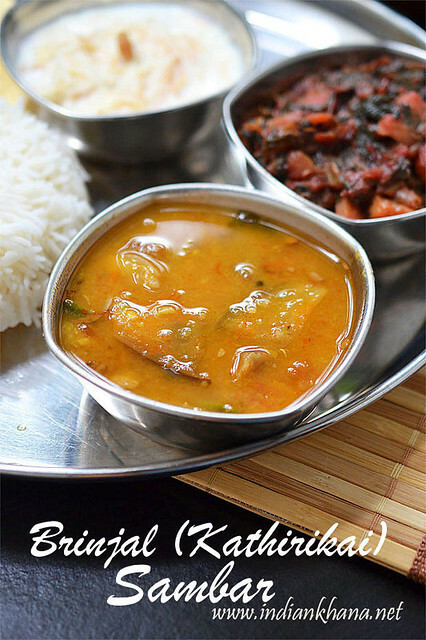 Delicious and easy brinjal sambar.